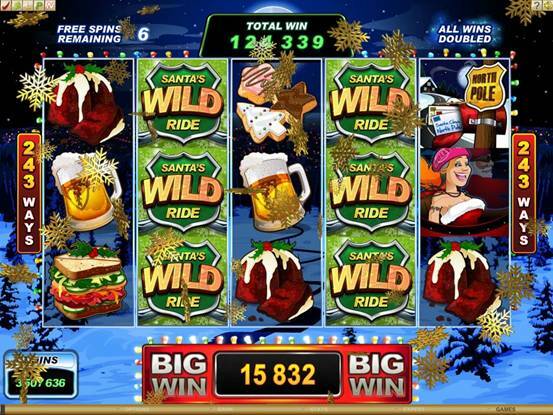 Santa’s Wild Ride Video Slot. Christmas Online Slots. 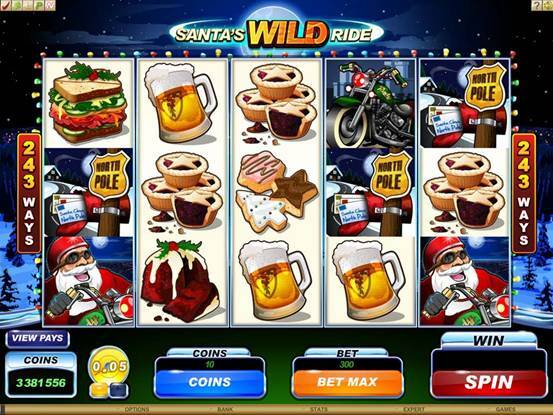 Enjoy wild holiday merriment this Christmas with the new video slot - Santa’s Wild Ride. Stay indoors and leave your chimney clear for this baddy Santa to deliver lots off exciting goodies! Forget the sleigh and reindeer as motorcycles are the means of transportation for this wild Santa. 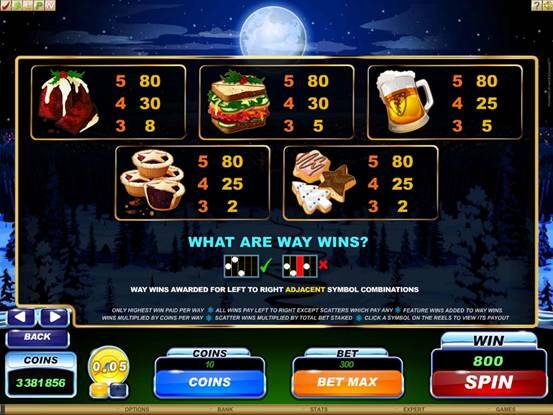 Santa is on his way to you this Christmas in the marvellous new 243 Way Slot game. This game offers Wilds galore in its exciting Free Spins features. 3 or more of the Scatter symbol will trigger 25 Free Spins with all wins doubled along with the choice of 1 of 3 amazing additional Wild Features. Trigger Free Spins and then decide on the Wild Feature of your choice. 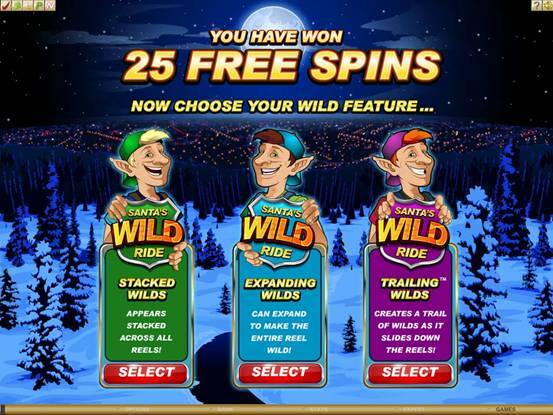 You can enjoy either Stacked Wilds; Expanding Wilds or Trailing Wilds during your Free Spins Feature. Just choose your favourite or try them all. Don’t be caught out listening for the jingle of Santa’s bells but rather wait for the roaring sound of his Motorcycle – Rudy, as it comes blaring round the corner. Look out for Santa and his Wild Ride with helmet, goggles and hot babe on the side. 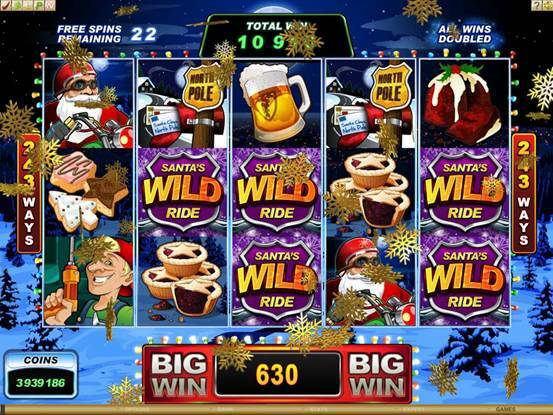 Santa’s Wild Ride is a 5-reel, 243 Ways Video Slot, with an exciting Free Spins Feature triggered by 3 or more scatter symbols anywhere on the reels. An addition to all Free Spin wins being multiplied by 2x the player has the choice of 3 awesome Wild features within Free Spins. An on screen bonus game as well as the random wild multipliers in Base Game only adds to the enchantment of this exhilarating video slot. 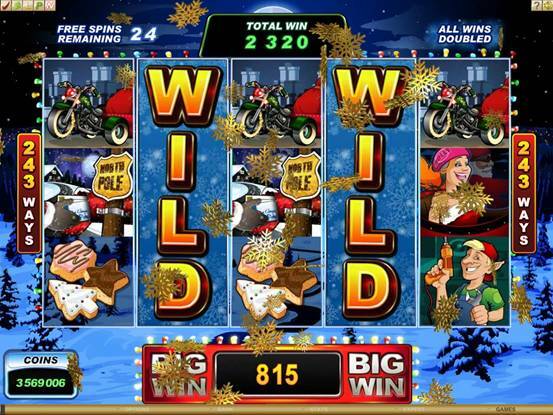 Royal Vegas festive season offerings this year include a Harley-riding Santa, with a choice of three styles of Wild in the five-reel, 243 ways to win video slot, SANTA'S WILD RIDE. This year the festive season figure has exchanged his traditional sleigh and reindeers for a more modern form of transportation as he roars around his beat delivering winning opportunities to fortunate players. Adding motorcycle servicing to their toy manufacturing skills are Santa's elves. Three of whom present the player with a choice of Wilds enabling the player to choose between stacked Wilds across all reels, expanding Wilds which can make an entire reel Wild, and trailing Wilds which create a trail of Wilds as it slides down the reels. This greater selection of Wilds empowers the player to create better winning combinations. 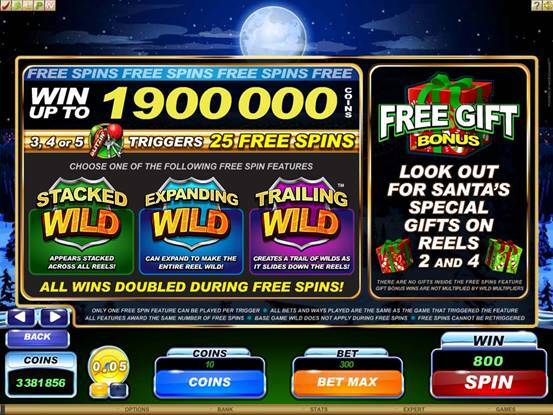 3, 4 or 5 of Santa's Harley keys across the reels triggers a generous 25 Free Spins in which all wins are doubled and the increased choice of Wilds can be deployed. 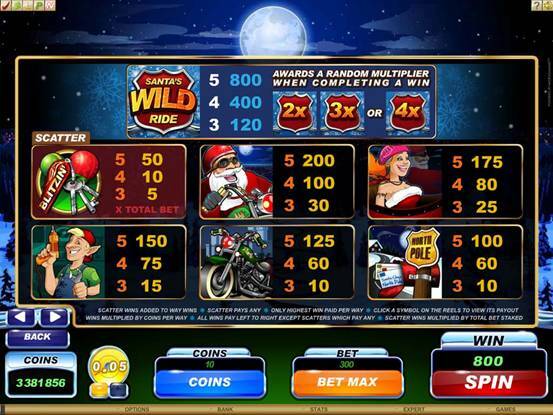 SANTA'S WILD RIDE also includes random wild multipliers between 2x and 4x. And a Bonus feature when the gift symbol appears on reels 2 and 4 which will award between 1x-10x Total bet. The razor sharp and colourful graphics supporting the theme feature comical characters such as a begoggled Santa, traditional festive season fare and a North Pole mailbox. With a maximum bet of 7.50 and a betting range between 0.01 and 0.05, this is a game that can deliver long periods of great entertainment laced with generous chances of reward. In free spins a maximum of 1 900 000 coins is achievable with a further 1 500 coins winnable in the bonus. Get Santa to boost your Christmas stocking by clicking over to Royal Vegas Casino and trying your luck on SANTA'S WILD RIDE. Golden Tiger Casino Play Santa’s Wild Ride Video Slot with $1500 totally free. Without leaving your home you have access to over 456 Las Vegas style casino games including all the favourites such as blackjack, roulette, slots and video poker. State-of-the-art gaming software is the most advanced in the industry - the realistic graphics, exciting sound effects and smooth gameplay are truly unbelievable!